Excuse me while I pay homage to THE #1 FRIGGIN' RAWK 'N ROLL RECORD OF THE YEAR!! The SUPERSUCKERS have harnessed every single ounce of power this evil rock music has to offer and they've crammed it onto one tiny piece of shiny plastic. You are gonna want to call this punk because it has all the energy, anger and visceral passion that punk has but there is no way you can settle for a description as mundane as "punk". It's just too rockin'. Too many guitar solos. Too many ugly and raw spots. This is more like 70's guitar rock with a blood lust. Each and every song is catchy (not poppy, mind you, but catchy like a particularly virulent STD virus), grating, harsh and in most cases offensive. Drugs, girls and good times are the themes and subtlety is not a consideration. 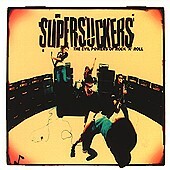 If all you know of the SUPERSUCKERS is their country punk experimentations then you are in for a big surprise. This album is as down to earth and nitty gritty as say "Must've Been High" but in distinct contrast "The Evil Powers..." will rip you a new one. This is one of those CDs that you stick in the ole' player with only mild expectations and end up standing there with your draw dropped to the floor in utter amazement. How can any one band, without a major overhaul in personnel, make such a massive evolutionary ("evil"lutionary?) leap in the course of just one album? Who know and who cares. The proof is as close as your local CD store. Supersuckers: Must've Been Live Suplex: Radio Transport... Are You Leaving?